This is a must-do activity when visiting the Garden Route! If you cannot book in Gansbaai or Cape Town then this is just as good! In the summer months the water is warm and visibility good compared to the cape. 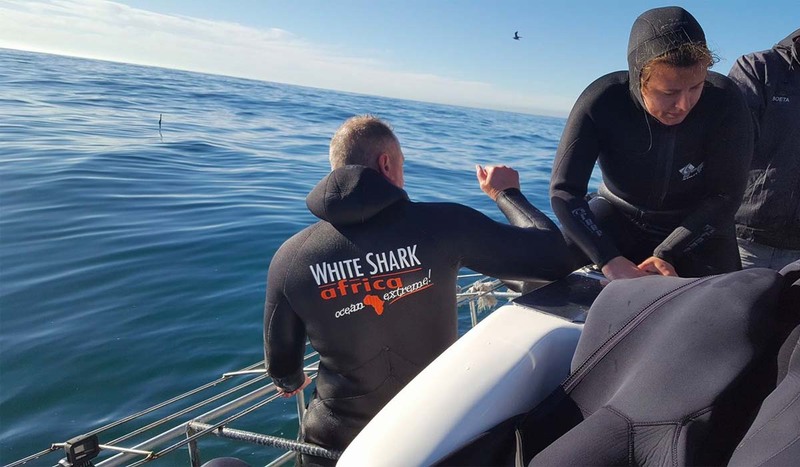 White Shark Africa have learned their trade from the Gansbaai shark cage diving and run their trips in a very similar way. The boat ‘Shark Warrior’ is a 10.5m long and 4m wide cat. The boat has a large top deck which is excellent for viewing the sharks and for those clients wishing not to dive and just watch the sharks. There is an inside cabin for protection from the wind and a toilet on board. The cage is a 6 man cage which is 3.2 meters long. 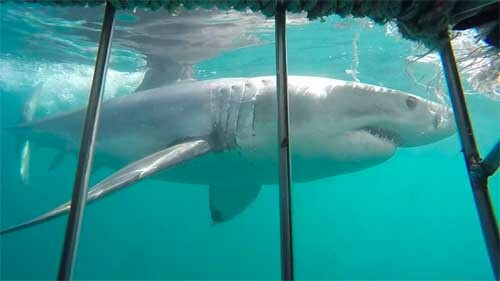 When the cage goes into the water, is tied to the side of the boat and flats approximately 0.5m above the water. This allows for plenty of space for divers to rest above the surface between passes by the sharks. When all the divers are in the cage, there is a lid on top which is closed to cover the top to protect the divers. This lid can be lifted quickly should a diver want to leave the cage. There are plenty of places to hold inside the cage and the dive is very easy for any level of swimmer or diver. The Crew will then immediately start chumming the water to attract the sharks. The sharks do not come to the area because of the chumming but if they are in the vicinity then they will follow the chum line to the boat. The sharks smell something in their natural diet and recognise this as dead prey so are normally relaxed and cautious around the boat when the crew are chumming. Once the sharks are comfortable with the boat then the crew will drop the cage into the water and cage diving will commence! The trips last between 2 1/2 – 3 hours at sea. 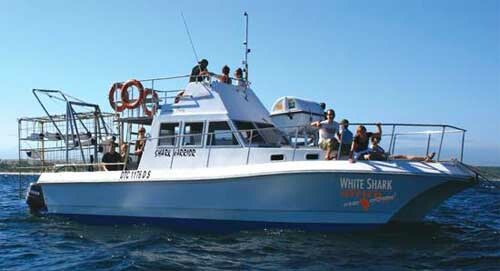 White Shark Africa is an excellent white shark diving company and the only one in Mossel Bay and the Garden Route. The Company was founded in 1995 and has recently changed ownership in the last few years. The new owners are very experienced in the business and the business has gone from strength to strength. 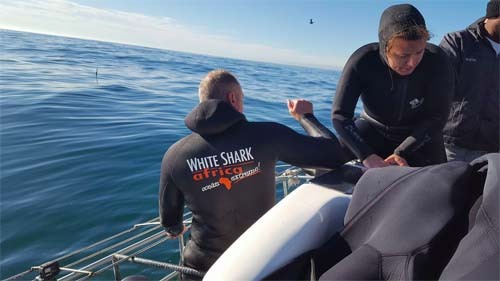 White Shark Africa have a passion for the sharks and have supported and assisted with the research for the sharks in the area. The company is co-owned by Craig Ferreira and Christo Kruger. Craig has years of experience in the industry and previously owned White Shark Projects based in Gansbaai. Christo is an avid marine conservationist and spearheads the operation in Mossel Bay. The crew have all been working with the sharks for many years and the skipper Phillip learned his trade in Gansbaai when he worked on the shark diving boats many moons ago. This is an excellent option if you have had your shark trips cancelled in Gansbaai due to rough seas. Mossel Bay faces the opposite direction so in the winter months it is very protected from the cape storms. Should you have a car and be flexible then this is an excellent alternative as a backup should you wish to see a Great White Shark before leaving the country.